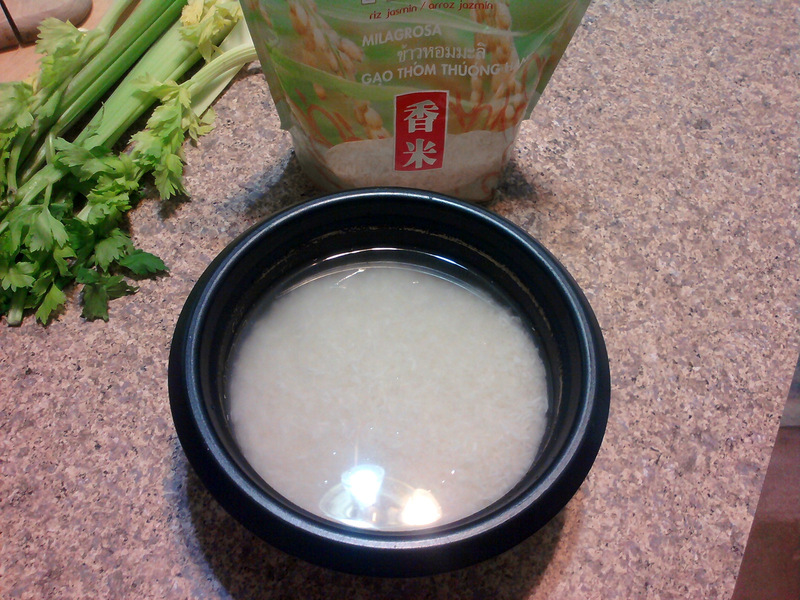 I call this Serenity Sauce, because it is my Asian version of comfort food. The strong, powerful ginger taste, is tamed by simple celery slices -- together they blend into a flavor that puts me at peace. This is an easy stir fry that you'll want to make often. ( I'm finding it difficult to measure ingredients...quite frankly, in our home, I often just "make do". So if I say add 3 celery stalks and you only have 2-- don't worry about it ;-) ...The day I took this picture was the day our grocer happened to be out of snow peas. I just bought another small tender pea pod they had available -- and made do. My recipes will always give you the ideal amounts and types though. 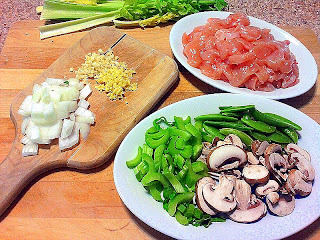 1) Always start your rice first, so it's cooking and ready by the time your stir fry is complete. 2) Heat oil on medium high in non-stick wok or frying pan. Add onion and cook until soft, about 5 minutes. 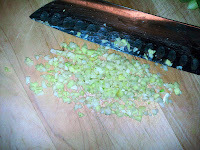 3) Stir in garlic and ginger and cook with the onion another 5 minutes. 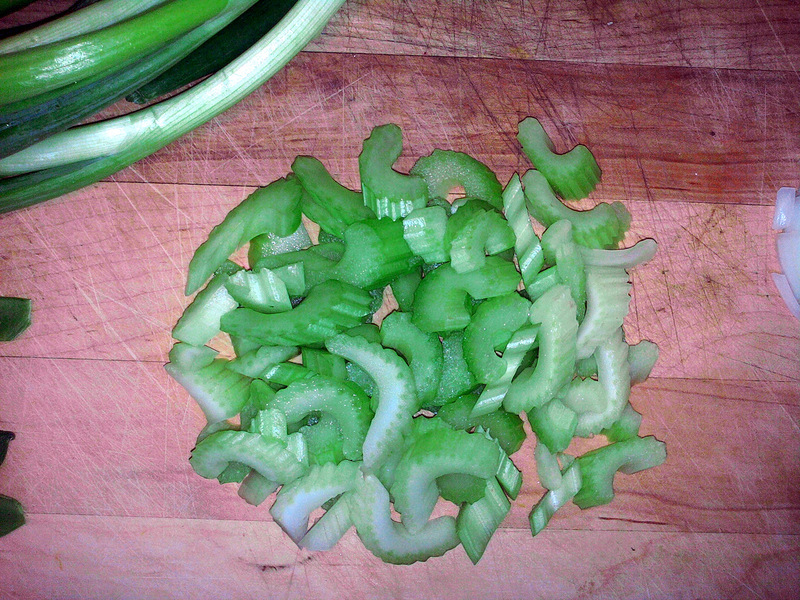 4) Stir in celery slices, (reserving 2 tbls) and cook an additional 5 minutes. At this point the house will be so aromatic, that your husband will suddenly appear at your side saying, "You are the BEST cook in the world." You will then give him a pleasant smile and not mind it when he dips a fork into your vegetable mixture, depositing the large bite into his mouth. Just as he leaves the room, children will begin appearing -- asking politely when dinner will be ready.... tell them 20 more minutes. 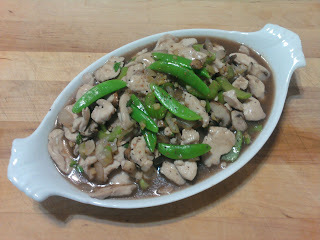 5) Stir in mushrooms, add large pinch of salt and sprinkle some pepper in as well. After a few minutes, remove this mixture to your serving dish. 6) Keep the pan hot and stir in your chicken slices, trying to brown gently and seal in the juices. cover for 5 minutes. 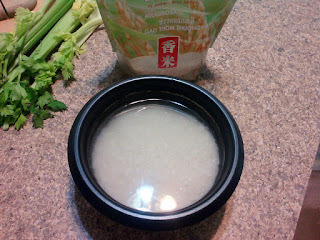 7) Add chicken stock and a LITTLE soy sauce --but PLEASE don't add too much or you will drown out the beautiful ginger flavor. So just add a teaspoon at a time-- you can always add more later. Stir and cover again for 10 minutes. 8) Return vegetables to the pan with the chicken along with water chestnuts. 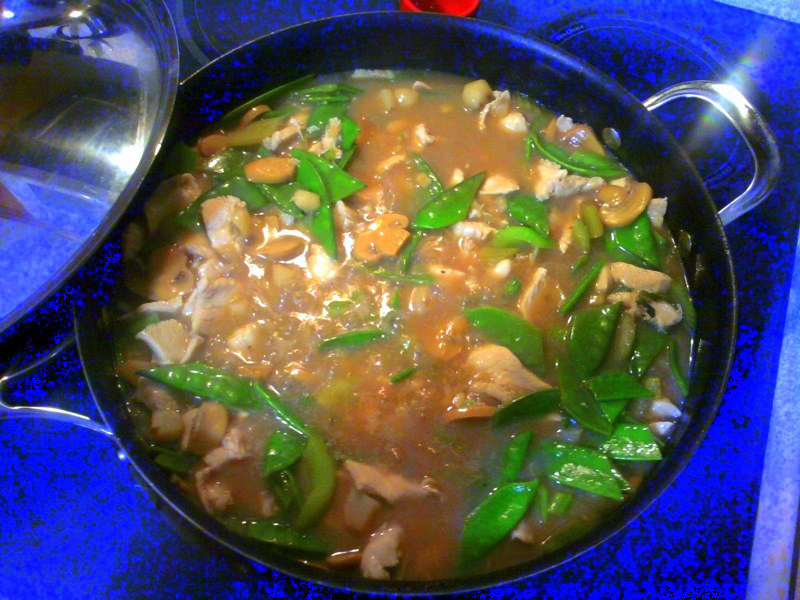 Add the cornstarch mixture -- stir and let thicken. 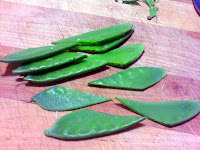 9) **Now add your snow peas and the 2 tbls celery and cover for a few more minutes. 10) Voila! Return to your serving dish (or serve from the pan if you like) over hot steamed rice. 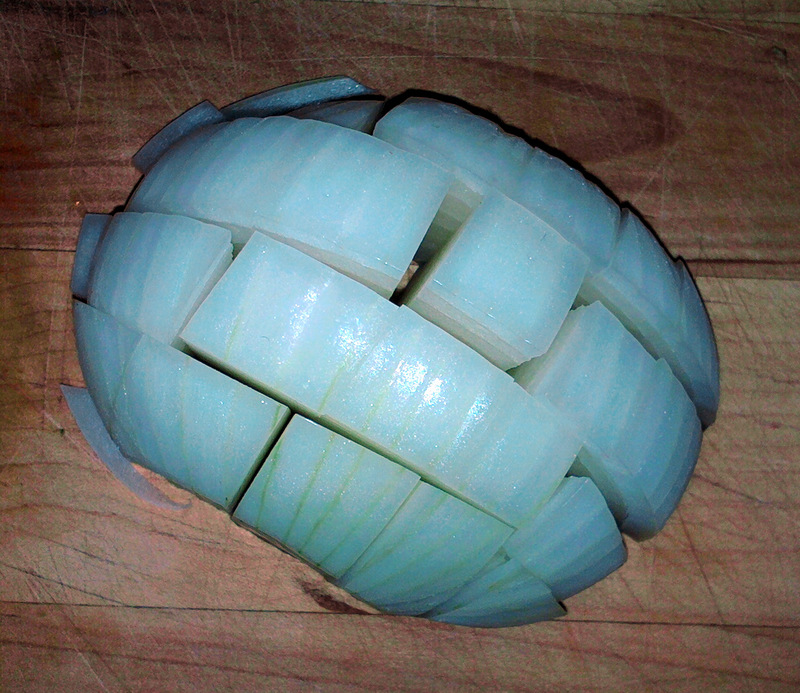 Garnish with green onion or chive if desired. A side of fresh orange slices are nice too. 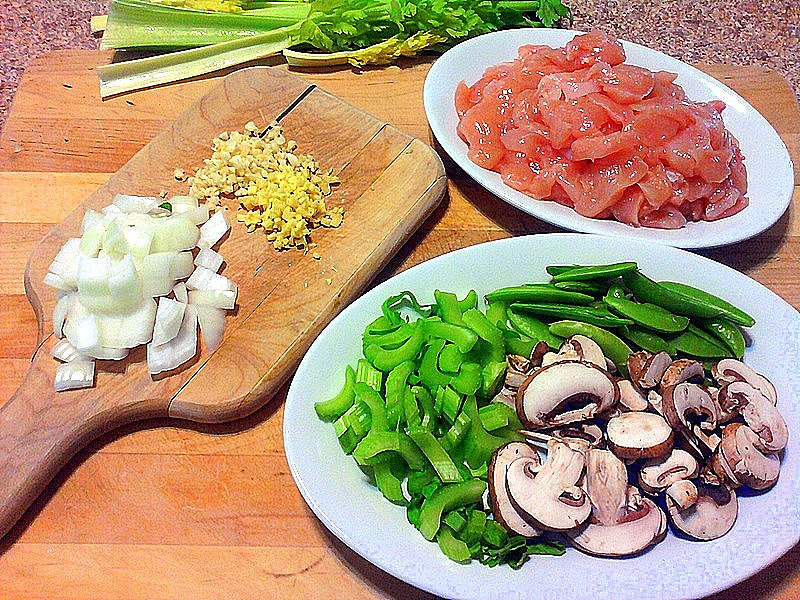 * Optional Ingredients (If you don't like my veggies, you can choose your own. You can also make this with other meats, shrimp or tofu. I sometimes make it with JUST veggies. ** This is so the vegetables are a nice bright green when serving. Try to remove from heat and not over cook. 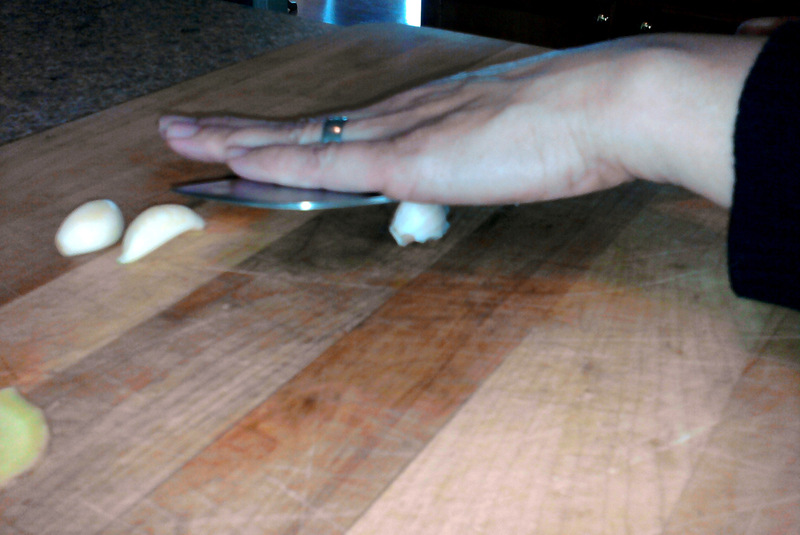 Garlic Peeling Tip: Lay the flat edge of your knife over your clove of garlic and give it a nice bang with your free hand. The skin will come off nicely now. 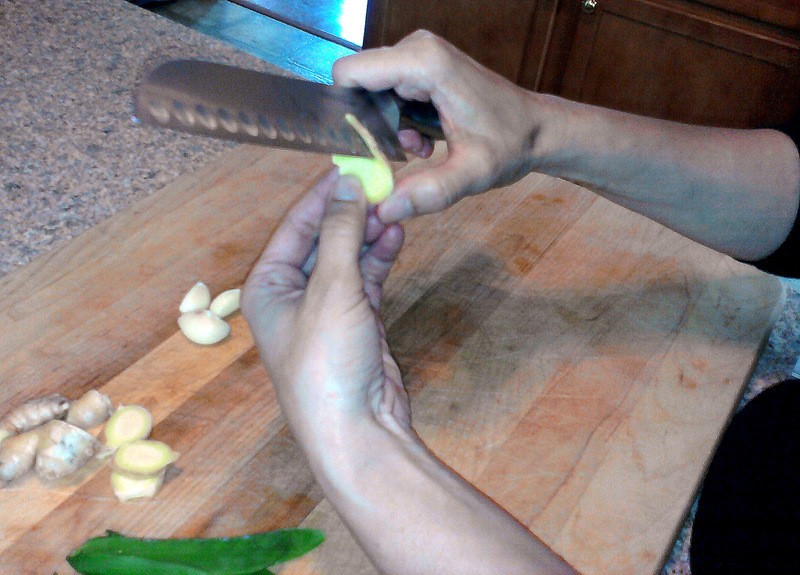 Ginger Peeling Tip: Slice your ginger into rounds first, then take your knife around the edge to easily peel. 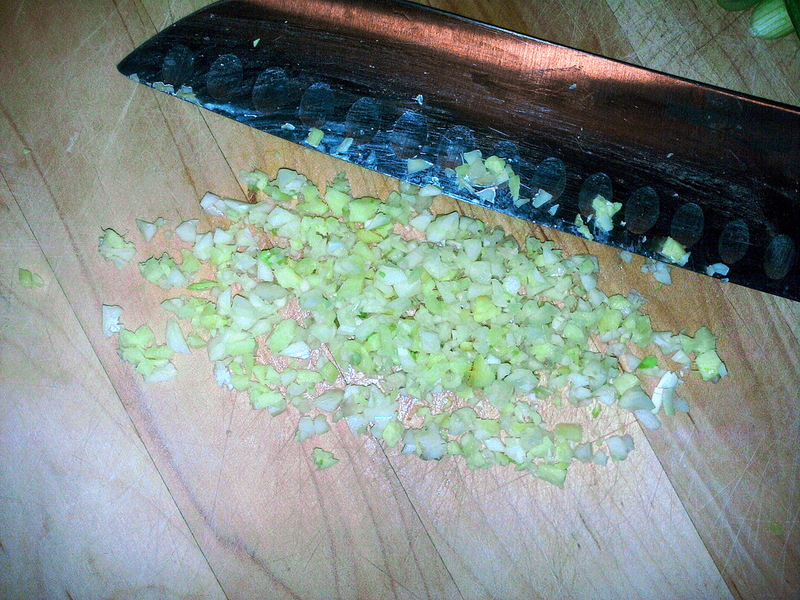 I like to chop garlic and ginger together.